There are few cars on the road that not only define a brand, but also set the tone of what the brand aspires to become. The first generation G35 Sedan was that vehicle for Infiniti. With its low-slung and aggressive stance, powerful V-6 engine and awesomely fun to drive nature, the 2003 G35 was the car that launched a thousand imitators and set the benchmark for all future Infiniti products. Now Infiniti is upping the ante with the 2009 G37 Sedan, fitting the sleek four-door with a more powerful engine and an impressive array of equipment. With a considerably lower base price than its American and European competitors, similar, if not much better power, the G37 is not only one of the entry-level luxury best bargains, but is also one of the most fun to drive. To us, it’s all about the larger and more powerful engine in the G37 Sedan – it’s a hoot to drive. We think the 6MT is pretty awesome as well – short throws and a nice level of stiffness. There are no flies on the new seven-speed automatic slush box either. The option packages are expensive and somewhat confusing. We’d like a base model – with paddle shifters and a navigation system. Also, the preemptive safety features are nice, but too obtrusive at times. Infiniti thinks it better to be safe than sorry, we beg to differ. Infiniti has raised the bar once more, with its next generation G-series Sedan, now called the G37 to reflect the change in engine size - a 3.7-liter DOHC 24-valve V-6 with 328 horsepower and 269 lb-ft of torque. The engine, the VQ37VHR, is Nissan and Infiniti's newest iteration of their powerful and torque-friendly six-cylinder engine, the VQ35. Using the newly developed VVEL (Variable Valve Event and Lift) system that combines hydraulic-controlled variable valve timing and electronically controlled variable valve lift on the intake side to help improve performance and response, the new 3.7 is a marked improvement of the last generation V-6. The Infiniti Sedan is fleet footed at speed or on the highway. We think the drive offers just the right combo of sportiness and comfort, something we think the BMW 3-Series tends to miss on occasion. The G37 gets a big bump in power and torque over the old 3.5-liter model thanks to an increase in displacement. The 3.7-liter V-6 puts down 328 hp and 269 lb-ft of torque via a brand-new seven-speed automatic with manual shift mode or through a best in class (yeah, I’m talking to you, BMW) six-speed manual gearbox. Both have power driven to the rear wheels, with the exception of the all-wheel drive model, which comes in an automatic only. Some add-ons to consider: the $3,200 premium package that adds comforts like a moonroof, Bose audio system, iPod interface, power driver’s lumbar support, a power tilt and telescoping steering wheel, HomeLink, Bluetooth and heated seats. We also like Infiniti’s “Scratch Shieldâ€ paint, now available in Sahara Sandstone and Moonlight white. The Infiniti Controller system, which comes standard on the G37, uses a dash-mounted scroll and directional button interface to control the car’s stereo and navigation systems via a seven-inch color display mounted above the instrument panel. The radio is controlled via both the standard controls on the dash and multi-function display scroll knob, while the display shows stereo tuning and disc/aux information and climate control settings. Navigation comes as a $2,200 option, but is highly recommended as it includes real-time traffic updates and a 9.3GB hard drive for music storage. The G37 puts out some mighty power but gas mileage is pretty darn good, all things considered. The 3.7-liter engine returns 18 city and 26 highway for rear-wheel-drive cars and 18 city and 25 highway for the all-wheel drive G37x, and both achieve a ULEV-II emissions rating. The G37’s cockpit feels more comfortable and accommodating than it does opulent, and it is framed around a simple, brushed aluminum center console topped by the display screen. The bright, multi-colored gauge cluster is a pleasure to look at and pairs well with the blue hues surrounding other interior controls. The seats are comfortable, yet properly bolstered for performance driving. An overall theme of the G37 Sedan is one of restrained aggression from the two large, squinty air intakes and slightly louvered hood, to the small, spoiler topping the clean-cut rear end. 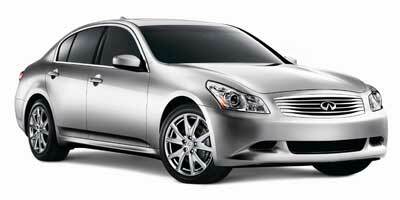 We think the smooth lines of the future-luxe G37 are stunning. The G37 Sedan is available in four models – $33,250 G37 Sedan, $33,700 G37 Sedan Journey, $34,250 G37S Sport 6MT and $35,750 G37x Sedan AWD, making its most direct competitors BMW’s 328i at $33,400, as well as the $32,700 Audi A4 2.0T. A well-equipped G37 Sport tips the scales in the $43,000 range, pushing it into the territory of the more capable $35,200 Audi TT, $40,700 Audi A5 and $40,100 BMW 335i coupe.